The handprint bear didn’t turn out as cute as I would have liked, but the footprint teddy bear is adorable! 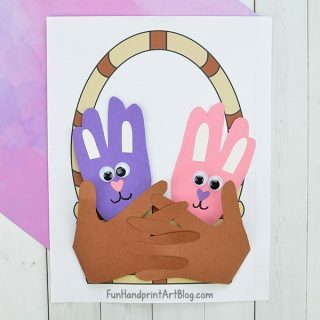 To make the handprint bear, place a brown (any color) handprint on a piece of paper and then add ears and a tail by using either the pinkie finger or index finger. I drew on a face and then added dots at the tip of each finger to create bear claws. To make the teddy bear, place a footprint on paper and then use the index finger to make ears. It would even look cute with the nose and a tail made with the pinkie finger. This would be a cute project for Teddy Bear Day which is in September! 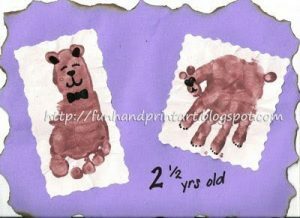 This was part of our bear themed crafts & activities – pop on over to our kids craft blog to check them out! 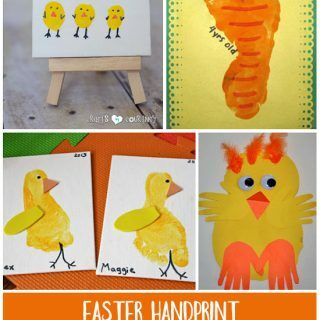 OH my goodness, I love handprint and footprint art! How did I not know about this blog before? I will be spending lots of time looking around here!